goTransverse recognized by leading independent research firm for its laser-focus on serving customers with complex business models. 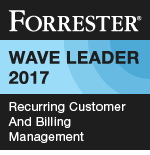 goTransverse, a leader in intelligent billing and agile monetization, announced that the company has been named a “Leader” in “The Forrester Wave™: Recurring Customer and Billing Management, Q3 2017,” by Forrester Research, Inc.
For this report, Forrester evaluated the strengths and weaknesses of top recurring customer and billing management vendors based on 35 criteria, which were grouped into three high-level categories: current offering, strategy and market presence. goTransverse achieved the highest score in the recurring billing and payments management criterion, and scored among the highest in the following criteria: product vision and corporate focus, roadmap planning, innovation roadmap, partner ecosystem, delivery model and commercial model. With the designation of a leader in the Forrester Wave, goTransverse adds another recognition to a year marked by high achievement, including its dual Pipeline Innovation Awards, Constellation ShortList™ for Smart Services Digital Monetization Platforms and top Billing Management vendor rating by MGI Research.